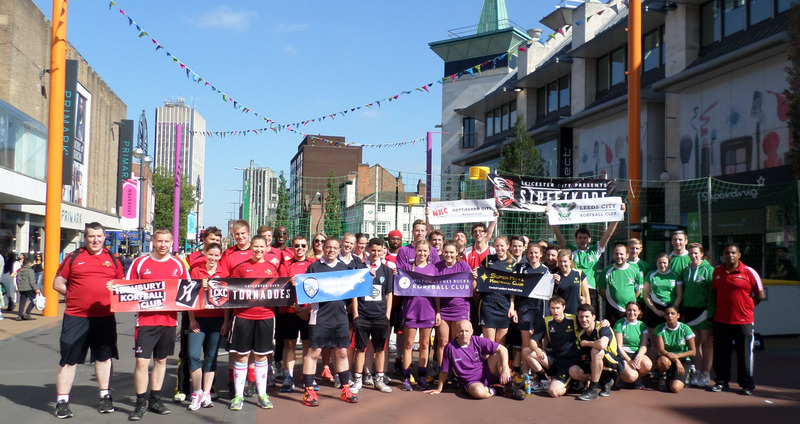 Leicester City Centre played host to a world first last Sunday as hundreds of people from Leicester and around the country descended on Humberstone Gare for ‘StreetKorf’. The event was a showcase for the sport of Korfball; a sport which is played in mixed gender teams try and shoot a ball through a ‘Korf’, or basket, suspended on top of a 3.5m pole. The main event was a tournament between seven teams from across the country which was eventually won by the city’s own Leicester City Tornadoes as they edged out Nottingham City by a single point. Over 40 players from London, Leeds, Milton Keynes and Nottingham had travelled to Leicester for the event. On top of the constant crowd that was watching the action all day, the event also had two ‘Have a go’ areas where over 300 people got their hands on a Korfball and tried out the sport for the first time. Korfball is played across 100 clubs and 300 teams in the UK, but it’s also played in over 60 countries around the world, many of whom were keeping in touch about the event. If you would like to find out more about Korfball, attend a taster session or join Leicester City Korfball Club visit www.leicesterkorfball.org.uk.